“We are only human.” – A saying that is often spoken, but too often forgotten. We all make mistakes. We are all different. We are all human. Today be kind because we are all human. Be human. Be kind. Guilt is sticky. Guilt is a sin. It is a nagging, draining, power-sucking sin. We are not intended to feel guilt by nature, but our human condition allows us to attach guilt to our hearts and minds. I am the worst when it comes to feeling guilty. I will let the slightest mishap or slip of the tongue weigh me down like a 2-ton anchor. I am not sure why I am so attractive to guilt, other than the fact that I am so desperate to always do the best job possible. The realization is starting to sink in that my definition of “best job possible” sometimes equates to a job that is “not really possible.” I need to get better at letting go. We are all a work-in-progress. I’ve been working hard to wash away the residue left from past guilt and have found that it makes living a lot easier. My desire to avoid the attraction to guilt has made it easier to notice the way it clings to others. It hurts me to see when those I love let guilt hold them back in their relationships. Guilt stinks! On August 23rd I began my teaching journey at State Tech. My lesson plans were written, my Introduction PowerPoints ready to go, syllabi were photocopied, and my broom was ready to fly. (More about the flying broom will be discussed in later posts.) What I was not prepared for was the openness my students would show towards learning. To kick things off in my COM 101 course, I created a grammar pre-test. It was important to know what grammar skills my students possessed. It consisted of 15 multiple choice questions and was not for a grade. Within a minute or two of starting the test, I could see frustration forming on the faces of my students. After four or five minutes, their grumblings were audible. By the time they finished their pre-test, I could almost smell a mutiny. In my most professional and reassuring manner, I tried to persuade them it would ok.
We finished up the pre-test and headed back to our regular classroom. I observed head shaking and defeated student reactions as I followed them. I had just learned that grammar was not my students’ strong suit. Today was the first day of school for my kiddos. My 7 year-old arrived eager, confident, and happy. She has a terrifically sunny disposition and sees good in most everything. My 5 year-old can be a bit nervous at times, but is a lot of fun. He was soooooo ready to go to kindergarten. He smiled big and was the first one in the car. When we pulled in the school parking lot, a switch flipped. He went so white I thought he would faint. After a very tearful departure, my day was ruined. I was terrified that my son was miserable and would never like school. As the day progressed my fears eased and I went about my necessary tasks. Unfortunately one of the tasks brought me right past school to the post office. We live in a small town. There was no avoiding it. It was near lunch time and I just knew my son would be out at recess, see me, and take off running. What was I going to do? I drove as quickly as was safely possible past the school, never pausing to look at the faces of the playing children. I ran in and out of the post office as quickly as possible and got the heck out of Dodge. No children came crying down the street so I felt like I bypassed that landmine and went back to my to-do list. Getting groceries was the last thing to do on my list. After purchasing all of the things on my list, I could do one of two things. 1. Drive the four miles home, drop off the groceries, and prolong my son’s misery by not being one of the first parents at school. 2. Go sit in the parking lot and work on my coursework for the new class I start teaching next week and greet my babies with open arms as soon as they were dismissed. Option 2 was my choice. I memorized these words from a bookmark I found at the library when I was 12. Whenever people tell me they don’t like to read, I recite this poem to them. Often they ask me to repeat it a few times and agree there is merit to my message, but they still don’t like to read. I understand. There are ways of learning that don’t appeal to me either. Reading books or references works can be cumbersome. Reading instructional texts can be torture. Reading something you are interested in can change your life. Fourteen years ago I walked into MLK hall on the campus of Lincoln University in Jefferson City, MO ready to start my journey as an education major. I studied my schedule and made my way up two flights of stairs to my first classroom. It was Humanities 101. I wasn’t sure what a humanities course would be about, but I knew I was eager to get started. The instructor was a wiry, animated man, who admitted to being technologically challenged, so his syllabus would be ready at our next meeting. (“The stupid copier wouldn’t give up his papers.”) His movements were jerky and delibrate and his build gave him the aura of a scarecrow. But clearly this man had a brain and was a talented storyteller. The story he told about names in the local telephone book and where they came from was intriguing. He shared the historical roots of names and explained how they were related to those of famous American writers. It was a really cool start to my semester but I could not figure out how this would tie into my humanities course, so I sat tight. 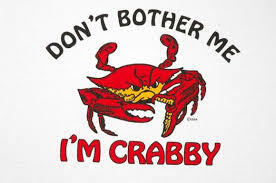 Too often I find myself saying, “Please don’t make me crabby,” to my children. Then I have to remind myself that others can’t make us feel a certain way; we control our emotions. And, yet, my pesky offspring just know how to push my buttons. I have always heard that those we love the most have the greatest power to aggravate or annoy us. We are most easily agitated by the ones we live with. It is our daily interactions that make us vulnerable to the bothersome bantering, but those same squabbles teach us to stick together, even when we annoy each other. There are many benefits to letting our kids see us overcome our aggravations. It allows them to learn that life isn’t always roses and rainbows. Hopefully we provide them with opportunities to see how loving, caring invidividuals deal with stress. When siblings and cousins bother each other, they learn how to resolve conflicts and how to communicate past their differences. Put your energy into resolving your stresses in the healthiest ways and your grumpiness will come much less easily. If you do find the grumpiness coming on, it’s ok; stay positive and the crabbiness will scamper right away.